It is your right, your duty and your responsibility to vote. Casting a vote is the best way to make your voice heard. Election outcomes are determined by those individuals who get out and vote. Every day elected officials make important decisions about the issues that impact your job, your pay and your retirement security. When making such decisions elected officials take into consideration the interests of the individuals who helped get them into office. Voting does not guarantee that an elected official will always act in the best interest of his/her constituents, but abstaining from voting denies constituents any say how his/her elected official acts in office. The United States Election Assistance Commission (EAC) has made it easier to register to vote. In almost all states you can register to vote by mail. Simply download and mail back the National Mail Voter Registration Form. Residents of North Dakota, Wyoming, American Samoa, Guam, Puerto Rico, and the U.S. Virgin Islands are ineligible to register by mail and should contact the state election office for more infomation about getting registered. In some states, you can also register online to vote. To learn if your state offers online voter registration, please contact your state election office. 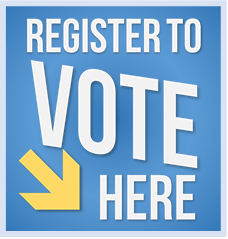 For more information about registering to vote and additional voter resources visit the EAC website.